You are here: Home » Easy Day 5 Miles and a Busy Saturday! Easy Day 5 Miles and a Busy Saturday! So it is Saturday again. Saturday’s are busy for us as a family. We have Soccer games for Aaron at 9:00am and then we have piano lessons for the entire family. Today we are doing the lessons at our teachers house as that is where we are having a piano recital this Friday. Today is a dry run for that. We are then meeting with friends to get the kids together and have have some fun. So before all of that I needed to get in my training for the day. Today is a going to be a hot one here in the Philadelphia area. It is to be in 90’s F which will be helpful for me to begin to get used to this heat. The run today was set to be an easy run as I am racing a 5K tomorrow and the goal for tomorrow is to race that all out and see where my fitness is at this point. 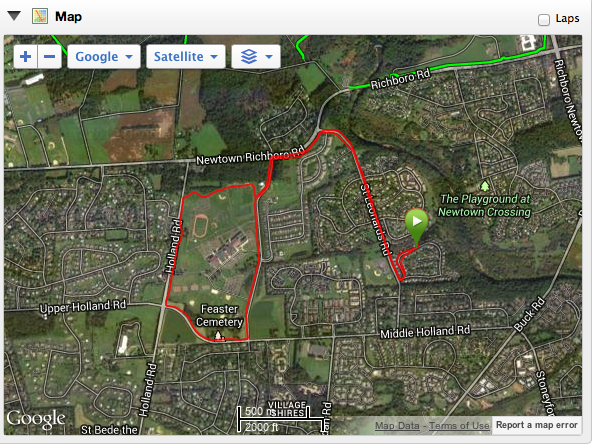 So today I ran on the CRS 5 mile loop. I started at 7:00 am this mornign and it was already in the 70’s and humid. I was happy to feel the warmer weather. 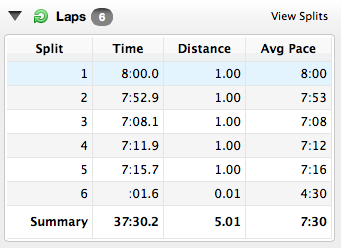 The first mile or so I was still asleep by 2 mile in I was forcing myself to not run sub 7’s. That is hopefully a good sign. I am looking forward to a good test tomorrow on fast course. 45 days until I leave for Israel, 47 days until the opening ceremony and 51 days until the Maccabiah Games Half Marathon! ← 7 Miles with Pickups – Bring on the Heat!